FACT: A perennial plant, growing up to 20-25 cm. The slender, elongated and leafless stalk bears yellow or purple flowers. Sorry, there is no photo available. If you have one, please submit here. Thalictrum alpinum is a species of flowering plant in the buttercup family known by the common names alpine meadow-rue and arctic meadow-rue. It is native to Arcticand alpine regions of North America and Eurasia, including Alaska, northern Canada, and Greenland, and it occurs in cold, wet, boggy habitats in high mountains farther south. Alpine meadow-rue is a rhizomatous perennial herb growing up to 5 to 25 cm (2 to 10 in) tall. The stems are erect and usually unbranched and leafless. Most of the leaves form a basal rosette, their compound blades are one to two pinnate and divided into small, triangular-ovate, scalloped leaflets. Each leaflet is longer than it is broad, slightly recurved, shiny dark green above and pale bluish-green below. The inflorescence is a raceme of flowers that arches over as the flowers and fruit develop. Each flower has a bell-shaped calyx of green or purplish sepals bearing up to fifteen long purple stamens tipped with large yellow anthers. There is a single carpel and no petals. The fruit is a dry achene with longitudinal ridges and tipped with a bristle. 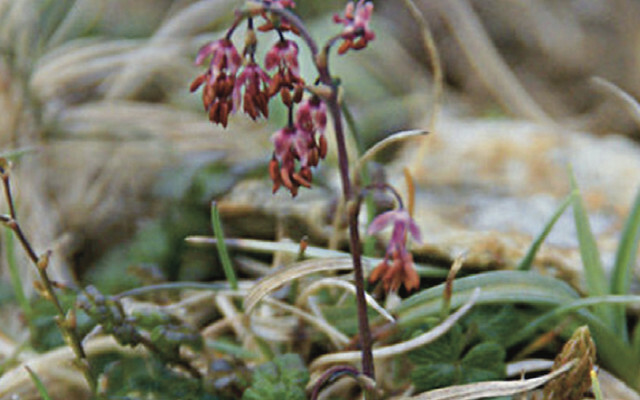 This species is normally pollinated by wind while other species of meadow-rue are usually insect-pollinated.